This caused my loop to be optimised out! I worked out how to build and upload outside the Arduino IDE and using an optimisation flag of -O0 I now get 39.6 seconds with the single pixel version. Writing 8 pixels per loop takes 3.9 seconds. 16 pixels is dispatched in 1.9 seconds and 32 pixels takes 0.97 seconds. At last now we have some real data! Here is a graph of those points. We have certainly reached the point of diminishing returns at 32 pixels. We might be able squeeze a bit more bit more by increasing the pixels but I tried 64 pixels and I think the Arduino ran out of flash. 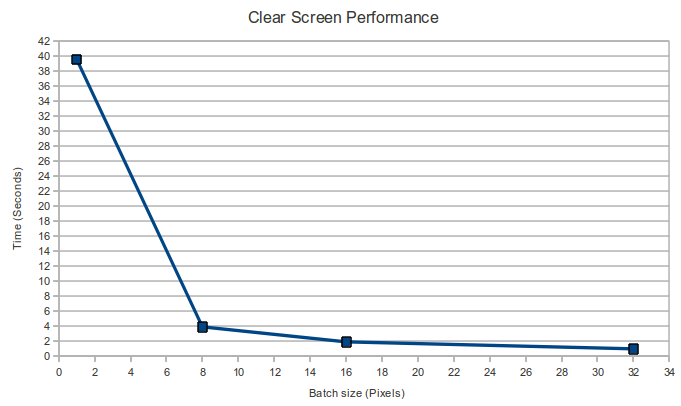 So if all we are doing is clearing the screen at 60 FPS, we have a 97% duty cycle. At 20 Mhz this becomes 78%. That leaves some time for drawing other things.